This is a good time of year to see the Andromeda galaxy. When the sun sets and the sky fades to black, Andromeda materializes high in the eastern sky. You can find it with your unaided eye. At first glance, it looks like a very dim, fuzzy comet, wider than the full moon. Upon closer inspection through a backyard telescope—wow! It’s a beautiful spiral galaxy. At a distance of “only” 2 million light-years, Andromeda is the nearest big galaxy to the Milky Way, and astronomers know it better than any other. The swirling shape of Andromeda is utterly familiar. Not anymore. A space telescope named GALEX has captured a new and different view of Andromeda. According to GALEX, Andromeda is not a spiral but a ring. GALEX is the “Galaxy Evolution Explorer,” an ultraviolet telescope launched by NASA in 2003. Its mission is to learn how galaxies are born and how they change with age. GALEX’s ability to see ultraviolet (UV) light is crucial; UV radiation comes from newborn stars, so UV images of galaxies reveal star birth—the central process of galaxy evolution. GALEX’s sensitivity to UV is why Andromeda looks different. To the human eye (or to an ordinary visible-light telescope), Andromeda remains its usual self: a vast whirlpool of stars, all ages and all sizes. To GALEX, Andromeda is defined by its youngest, hottest stars. They are concentrated in the galaxy’s core and scattered around a vast ring some 150,000 light years in diameter. It’s utterly unfamiliar. “Looking at familiar galaxies with a new wavelength, UV, allows us to get a better understanding of the processes affecting their evolution,” says Samuel Boissier, a member of the GALEX team at the Observatories of the Carnegie Institution of Washington. Beyond Andromeda lies a whole universe of galaxies—spirals, ellipticals and irregulars, giants and dwarfs, each with its own surprising patterns of star formation. To discover those patterns, GALEX has imaged hundreds of nearby galaxies. Only a few, such as Andromeda, have been analyzed in complete detail. “We still have a lot of work to do,” says Boissier, enthusiastically. GALEX has photographed an even greater number of distant galaxies—“some as far away as 10 billion light-years,” Boissier adds—to measure how the rate of new star formation has changed over the universe's long history. Contained in those terabytes of data is our universe's “life story.” Unraveling it will keep scientists busy for years to come. For more about GALEX, visit http://www.galex.caltech.edu. Kids can see how to make a galactic art project at http://spaceplace.nasa.gov/en/kids/galex/art.shtml. This article was provided by the Jet Propulsion Laboratory, California Institute of Technology, under a contract with the National Aeronautics and Space Administration. Caption: The GALEX telescope took this UV image of the Andromeda galaxy (M31), revealing a surprising shape not apparent in visible light. Around 2015, NASA and the European Space Agency plan to launch one of the biggest and most exacting space experiments ever flown: LISA, the Laser Interferometer Space Antenna. LISA will consist of three spacecraft flying in a triangular formation behind Earth. Each spacecraft will beam a laser at the other two, continuously measuring their mutual separation. The spacecraft will be a mind-boggling 5 million kilometers apart (12 times the Earth-Moon distance) yet they will monitor their mutual separation to one billionth of a centimeter, smaller than an atom’s diameter. LISA’s mission is to detect gravitational waves—ripples in space-time caused by the Universe’s most violent events: galaxies colliding with other galaxies, supermassive black holes gobbling each other, and even echoes still ricocheting from the Big Bang that created the Universe. By studying the shape, frequency, and timing of gravitational waves, astronomers believe they can learn what’s happening deep inside these acts of celestial violence. The problem is, no one has ever directly detected gravitational waves: they’re still a theoretical prediction. So no one truly knows what they “sound” like. Furthermore, theorists expect the Universe to be booming with thousands of sources of gravitational waves. Unlike a regular telescope that can point to one part of the sky at a time, LISA receives gravitational waves from many directions at once. It’s a cacophony. Astronomers must figure how to distinguish one signal from another. An outburst is detected! Was it caused by two neutron stars colliding over here or a pair of supermassive black holes tearing each other apart in colliding galaxies over there? “It’s a profound data-analysis problem that ground-based astronomers don’t encounter,” says E. Sterl Phinney, professor of theoretical physics at the California Institute of Technology in Pasadena. To that end, theorists and instrument-designers have been spending time together brainstorming, testing ideas, scrutinizing plans, figuring out how they’ll pluck individual voices from the cacophony. And they’re making progress on computer codes to do the job. For more info about LISA, see lisa.nasa.gov . Kids can learn about black holes and play the new “Black Hole Rescue!” game on The Space Place Web site at http://spaceplace.nasa.gov/en/kids/blackhole/. When a massive star reaches the end of its life, it can explode into a supernova rivaling the brilliance of an entire galaxy. What’s left of the star fades in weeks, but its outer layers expand through space as a turbulent cloud of gases. Astronomers see beautiful remnants from past supernovas all around the sky, one of the most famous being the Crab Nebula in Taurus. When a star throws off nine-tenths of its mass in a supernova, however, it also throws off nine-tenths of its gravitational field. Astronomers see the light from supernovas. Can they also somehow sense the sudden and dramatic change in the exploding star’s gravitational field? Yes, they believe they can. According to Einstein’s general theory of relativity, changes in the star’s gravitational field should propagate outward, just like light—indeed, at the speed of light. Those propagating changes would be a gravitational wave. Einstein said what we feel as a gravitational field arises from the fact that huge masses curve space and time. The more massive an object, the more it bends the three dimensions of space and the fourth dimension of time. And if a massive object’s gravitational field changes suddenly—say, when a star explodes—it should kink or wrinkle the very geometry of space-time. Moreover, that wrinkle should propagate outward like ripples radiating outward in a pond from a thrown stone. The frequency and timing of gravitational waves should reveal what’s happening deep inside a supernova, in contrast to light, which is radiated from the surface. Thus, gravitational waves allow astronomers to peer inside the universe’s most violent events—like doctors peer at patients’ internal organs using CAT scans. The technique is not limited to supernovas: colliding neutron stars, black holes and other exotic objects may be revealed, too. NASA and the European Space Agency are now building prototype equipment for the first space experiment to measure gravitational waves: the Laser Interferometer Space Antenna, or LISA. LISA will look for patterns of compression and stretching in space-time that signal the passage of a gravitational wave. Three small spacecraft will fly in a triangular formation behind the Earth, each beaming a laser at the other two, continuously measuring their mutual separation. Although the three ‘craft will be 5 million kilometers apart, they will monitor their separation to one billionth of a centimeter, smaller than an atom’s diameter, which is the kind of precision needed to sense these elusive waves. LISA is slated for launch around 2015. To learn more about LISA, go to http://lisa.jpl.nasa.gov. Kids can learn about LISA and do a gravitational wave interactive crossword at http://spaceplace.nasa.gov/en/kids/lisaxword/lisaxword.shtml. Caption: LISA’s three spacecraft will be positioned at the corners of a triangle 5 million kilometers on a side and will be able to detect gravitational wave induced changes in their separation distance of as little as one billionth of a centimeter. In 1977, Voyager 1 left our planet. Its mission: to visit Jupiter and Saturn and to study their moons. The flybys were an enormous success. Voyager 1 discovered active volcanoes on Io, found evidence for submerged oceans on Europa, and photographed dark rings around Jupiter itself. Later, the spacecraft buzzed Saturn’s moon Titan—alerting astronomers that it was a very strange place indeed! —and flew behind Saturn’s rings, seeing what was hidden from Earth. Beyond Saturn, Neptune and Uranus beckoned, but Voyager 1’s planet-tour ended there. Saturn’s gravity seized Voyager 1 and slingshot it into deep space. Voyager 1 was heading for the stars—just as NASA had planned. Now, in 2005, the spacecraft is nine billion miles (96 astronomical units) from the Sun, and it has entered a strange region of space no ship has ever visited before. “We call this region ‘the heliosheath.’ It’s where the solar wind piles up against the interstellar medium at the outer edge of our solar system,” says Ed Stone, project scientist for the Voyager mission at the Jet Propulsion Laboratory. Out in the Milky Way, where Voyager 1 is trying to go, the “empty space” between stars is not really empty. It’s filled with clouds of gas and dust. The wind from the Sun blows a gigantic bubble in this cloudy “interstellar medium.” All nine planets from Mercury to Pluto fit comfortably inside. The heliosheath is, essentially, the bubble’s skin. “The heliosheath is different from any other place we’ve been,” says Stone. Near the Sun, the solar wind moves at a million miles per hour. At the heliosheath, the solar wind slows eventually to a dead stop. The slowing wind becomes denser, more turbulent, and its magnetic field—a remnant of the sun’s own magnetism--grows stronger. So far from Earth, this turbulent magnetic gas is curiously important to human life. “The heliosheath is a shield against galactic cosmic rays,” explains Stone. Subatomic particles blasted in our direction by distant supernovas and black holes are deflected by the heliosheath, protecting the inner solar system from much deadly radiation. For more about the twin Voyager spacecraft, visit voyager.jpl.nasa.gov. Kids can learn about Voyager 1 and 2 and their grand tour of the outer planets at spaceplace.nasa.gov/en/kids/vgr_fact3.shtml. Caption: Voyager 1, after 28 years of travel, has reached the heliosheath of our solar system. Picture this: Eighty-eight million miles from Earth, a robot spacecraft plunges into a billowing cloud almost as wide as the planet Jupiter. It looks around. Somewhere in there, among jets of gas and dust, is an icy nugget invisible to telescopes on Earth—a 23,000 mph moving target. The ship glides deeper into the cloud and jettisons its cargo, the “impactor.” Bulls-eye! A blinding flash, a perfect strike. As incredible as it sounds, this really happened on the 4th of July, 2005. Gliding through the vast atmosphere of Comet Tempel 1, NASA’s Deep Impact spacecraft pinpointed the comet’s 3x7-mile wide nucleus and hit it with an 820-lb copper impactor. The resulting explosion gave scientists their first look beneath the crust of a comet. Credit the JPL navigation team. By sending commands from Earth, they guided Deep Impact within sight of the comet’s core. But even greater precision would be needed to strike the comet’s spinning, oddly-shaped nucleus. AutoNav, short for Autonomous Navigation, is a computer program full of artificial intelligence. It uses a camera to see and thrusters to steer—no humans required. Keeping its “eye” on the target, AutoNav guided the impactor directly into the nucleus. The system was developed and tested on another “Deep” spacecraft: Deep Space 1, which flew to asteroid Braille in 1999 and Comet Borrelly in 2001. The mission of Deep Space 1 was to try out a dozen new technologies, among them an ion propulsion drive, advanced solar panels and AutoNav. AutoNav worked so well it was eventually installed on Deep Impact. “Without AutoNav, the impactor would have completely missed the nucleus,” says JPL’s Ed Riedel, who led the development of AutoNav on Deep Space 1 and helped colleague Dan Kubitschek implement it on Deep Impact. En route to the nucleus, AutoNav “executed three maneuvers to keep the impactor on course: 90, 35, and 12.5 minutes before impact,” says Riedel. The nearest human navigators were 14 light-minutes away (round trip) on Earth, too far and too slow to make those critical last-minute changes. Having proved itself with comets, AutoNav is ready for new challenges: moons, planets, asteroids … wherever NASA needs an improbable bulls-eye. Dr. Marc Rayman, project manager for Deep Space 1, describes the validation performance of AutoNav in his mission log (http://nmp.nasa.gov/ds1/arch/mrlog13.html) (also check mrlog24.html and the two following). Also, for junior astronomers, the Deep Impact mission is described here (http://spaceplace.nasa.gov/en/kids/deepimpact/deepimpact.shtml). Caption: Comet Tempel 1, as seen by the Deep Impact impactor’s camera. Three last-minute AutoNav-controlled impact correction maneuvers enabled the Impactor to hit the bulls-eye. Today, we've become accustomed to seeing images of the Earth's swirling atmosphere from space every night on the evening news. Before 1960, no one had ever seen such images. The first-ever weather satellite was launched that year, kicking off a long line of weather satellites that have kept a continuous watch on our planet's fickle atmosphere—45 years and counting! The high-quality, extended weather forecasts that these satellites make possible have become an indispensable part of our modern society, helping commercial aircraft, recreational boaters, and even military operations avoid unnecessary risk from hazardous weather. But satellites don't last forever. Parts wear out, radiation takes its toll, and atmospheric drag slowly pulls the satellite out of orbit. Many weather satellites have a design life of only 2 years, though often they can last 5 or 10 years, or more. A steady schedule of new satellite launches is needed to keep the weather report on the news each night. In May 2005, NASA successfully launched the latest in this long line of weather satellites. Dubbed NOAA-N at launch and renamed NOAA-18 once it reached orbit, this satellite will take over for the older satellite NOAA-16, which was launched in September 2000. ”NOAA always keeps at least two satellites in low-Earth orbit, circling the poles 14 times each day,” explains Wilfred E. Mazur, Polar Satellite Acquisition Manager, NOAA/NESDIS. “As Earth rotates, these satellites end up covering Earth’s entire surface each day. In fact, with two satellites in orbit, NOAA covers each spot on the Earth four times each day, twice during the day and twice at night,” Mazur says. accustomed to will go on. Find out more about NOAA-18 and the history of polar-orbiting weather satellites at http://goespoes.gsfc.nasa.gov/poes. For kids and anyone else curious about the concept, the difference between polar and geosynchronous orbits is explained at http://spaceplace.nasa.gov/en/kids/goes/goes_poes_orbits.shtml. Caption: NOAA-18, the newest in a long line of weather and environmental satellites, launched May 20, 2005. How on earth could someone simply pick up one of NASA’s giant Deep Space Network (DSN) antennas—a colossal steel dish 12 stories high and 112 feet across that weighs more than 800,000 pounds—move it about 80 yards, and delicately set it down again? Yet that's exactly what NASA engineers recently did. One of the DSN dishes near Madrid, Spain, needed to be moved to a new pad. And it had to be done gingerly; the dish is a sensitive scientific instrument full of delicate electronics. Banging it around would not do. The Deep Space Network enables NASA to communicate with probes exploring the solar system. Because Earth is constantly rotating, a single antenna on the ground can communicate with a probe for only part of the day, when the probe is overhead. By placing large dishes at three locations around the planet—Madrid, California, and Australia—NASA can maintain contact with spacecraft around the clock. On a clear day (bad weather might blow the dish over! ), they began to slowly lift the dish. Hydraulic jacks at all four corners gradually raised the entire dish to a height of about 4.5 feet. Then Mammoet engineers positioned specialized crawlers under each corner. Each crawler looks like a mix between a flatbed trailer and a centipede: a flat, load-bearing surface supported by 24 wheels on 12 independently rotating axes, giving each crawler a maximum load of 194 tons! One engineer took the master joystick and steered the whole package in its slow crawl to the new pad, never exceeding the glacial speed of 3 feet per minute. The four crawlers automatically stayed aligned with each other, and their independently suspended wheels compensated for unevenness in the ground. Placement on the new pad had to be perfect, and the alignment was tested with a laser. To position the dish, believe it or not, Mammoet engineers simply followed a length of string tied to the pad’s center pivot where the dish was gently lowered. Find out more about the DSN at http://deepspace.jpl.nasa.gov/dsn/ . Kids can learn about the amazing DSN antennas and make their own “Super Sound Cone” at The Space Place, http://spaceplace.nasa.gov/en/kids/tmodact.shtml. Caption: The Giant Deep Space Network antenna in Madrid is moved using four 12-axle, 24-wheel crawlers. Have you ever gotten up in the middle of the night, walked to the bathroom and, in the darkness, tripped over your dog? A tip from the world of high-tech espionage: next time use night-vision goggles. Night vision goggles detect heat in the form of infrared radiation—a “color” normally invisible to the human eye. Wearing a pair you can see sleeping dogs, or anything that’s warm, in complete darkness. This same trick works in the darkness of space. Much of the exciting action in the cosmos is too dark for ordinary telescopes to see. For example, stars are born in the heart of dark interstellar clouds. While the stars themselves are bright, their birth-clouds are dense, practically impenetrable. The workings of star birth are thus hidden. That's why NASA launched the Spitzer Space Telescope into orbit in 2003. Like a giant set of infrared goggles, Spitzer allows scientists to peer into the darkness of space and see, for example, stars and planets being born. Dogs or dog stars: infrared radiation reveals both. The clear view provided by Spitzer recently allowed scientists to make a remarkable discovery: They found planets coalescing out of a disk of gas and dust that was circling—not a star—but a “failed star” not much bigger than a planet! Planets orbiting a giant planet? The celestial body at the center of this planetary system, called OTS 44, is only about 15 times the mass of Jupiter. Technically, it’s considered a “brown dwarf,” a kind of star that doesn’t have enough mass to trigger nuclear fusion and shine. Scientists had seen planetary systems forming around brown dwarfs before, but never around one so small and planet-like. Spitzer promises to continue making extraordinary discoveries like this one. Think of it as being like a Hubble Space Telescope for looking at invisible, infrared light. Like Hubble, Spitzer offers a view of the cosmos that’s leaps and bounds beyond anything that came before. Spitzer was designed to operate for at least two and a half years, but probably will last for five years or more. For more about Spitzer and to see the latest images, go to http://www.spitzer.caltech.edu/spitzer. Kids and grown-ups will enjoy browsing common sights in infrared and visible light at the interactive infrared photo album on The Space Place, http://spaceplace.nasa.gov/en/kids/sirtf1/sirtf_action.shtml. 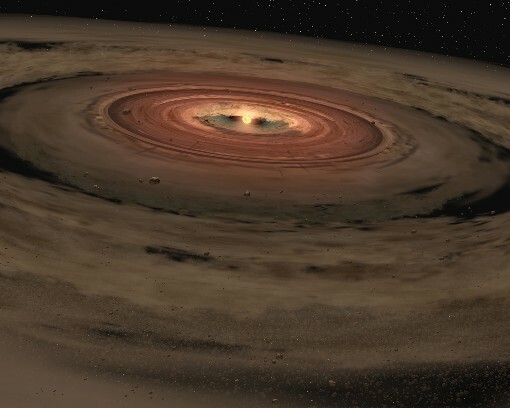 CAPTION: An artist’s rendering of brown dwarf OTS44 with its rotating planetary disk. When JPL research scientist Michael Garay first heard the news that a tsunami had struck southern Asia, he felt the same shock and sadness over the tremendous loss of human life that most people certainly felt. Later, though, he began to wonder: were these waves big enough to see from space? So he decided to check. At JPL, Garay analyzes data from MISR—the Multi-angle Imaging SpectroRadiometer instrument aboard NASA's Terra satellite. He scoured MISR images from the day of the tsunami, looking for signs of the waves near the coasts of India, Sri Lanka, Indonesia, and Thailand. 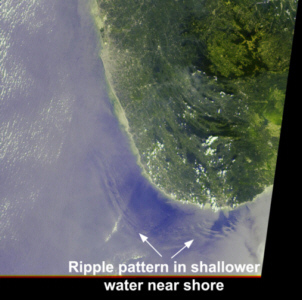 Looking at an image of the southern tip of Sri Lanka taken by one of MISR's angled cameras, he spotted the distinct shape of waves made visible by the glint of reflected sunlight. They look a bit like normal waves, except for their scale: These waves were more than a kilometer wide! Most satellites have cameras that point straight down. From that angle, waves are hard to see. But MISR is unique in having nine cameras, each viewing Earth at a different angle. “We could see the waves because MISR's forward-looking camera caught the reflected sunlight just right,” Garay explains. In another set of images, MISR’s cameras caught the white foam of tsunami waves breaking off the coast of India. By looking at various angles as the Terra satellite passed over the area, MISR’s cameras snapped seven shots of the breaking waves, each about a minute apart. This gave scientists a unique time-lapse view of the motion of the waves, providing valuable data such as the location, speed, and direction of the breaking waves. Realizing the importance of the find, Garay contacted Vasily Titov at the National Oceanic and Atmospheric Administration’s Pacific Marine Environmental Laboratory in Seattle, Washington. Titov is a tsunami expert who had made a computer simulation of the Asian tsunami. Find out more about MISR and see the latest images at http://www-misr.jpl.nasa.gov/. Kids can read their own version of the MISR tsunami story at http://spaceplace.nasa.gov/en/kids/misr_tsunami. CAPTION: This December 26, 2004, MISR image of the southern tip of Sri Lanka was taken several hours after the first tsunami wave hit the island. It was taken with MISR’s 46° forward-looking camera. There's a planet in our solar system so cold that in winter its nitrogen atmosphere freezes and falls to the ground. The empty sky becomes perfectly clear, jet-black even at noontime. You can see thousands of stars. Not one twinkles. The brightest star in the sky is the Sun, so distant and tiny you could eclipse it with the head of a pin. There's a moon, too, so big you couldn't blot it out with your entire hand. Together, moonlight and sunshine cast a twilight glow across the icy landscape revealing . . . what? twisted spires, craggy mountains, frozen volcanoes? No one knows, because no one has ever been to Pluto. "Pluto is an alien world," says Alan Stern of the Southwest Research Institute in Colorado. "It's the only planet never visited or photographed by NASA space probes." That's about to change. 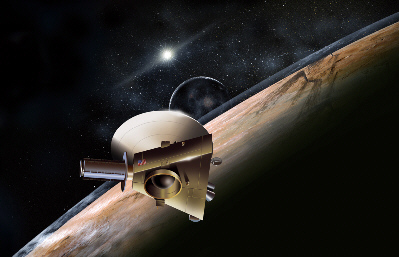 A robot-ship called New Horizons is scheduled to blast off for Pluto in January 2006. It's a long journey: More than 6 billion kilometers (about 3.7 billion miles). New Horizons won't arrive until 2015. "I hope we get there before the atmosphere collapses," says Stern, the mission's principal investigator. Winter is coming, and while it's warm enough now for Pluto's air to float, it won't be for long. Imagine seeing a planet's atmosphere collapse. New Horizons might! "This is a flyby mission," notes Stern. “Slowing the spacecraft down to orbit Pluto would burn more fuel than we can carry." New Horizons will glide past the planet furiously snapping pictures. "Our best images will resolve features the size of a house," Stern says. The cameras will also target Pluto's moon, Charon. Charon is more than half the size of Pluto, and the two circle one another only 19,200 kilometers (12,000 miles) apart. (For comparison, the Moon is 382,400 kilometers [239,000 miles] from Earth.) No wonder some astronomers call the pair a "double planet." Researchers believe that Pluto and Charon were created billions of years ago by some terrific impact, which split a bigger planet into two smaller ones. This idea is supported by the fact that Pluto and Charon spin on their sides like sibling worlds knocked askew. Yet there are some curious differences: Pluto is bright; Charon is darker. Pluto is covered with frozen nitrogen; Charon by frozen water. Pluto has an atmosphere; Charon might not. "These are things we plan to investigate," says Stern. Two worlds. So alike, yet so different. So utterly alien. Stay tuned for New Horizons. Find out more about the New Horizons mission at http://pluto.jhuapl.edu/. Kids can learn amazing facts about Pluto at http://spaceplace.nasa.gov/en/kids/pluto. CAPTION: New Horizons spacecraft will get a gravity assist from Jupiter on its long journey to Pluto-Charon. Credit: Southwest Research Institute (Dan Durda)/Johns Hopkins University Applied Physics Laboratory (Ken Moscati). Look toward the horizon in almost any major city, and you'll clearly see the gray-brown layer of smog and air pollution. Yet when you look straight up, the sky can appear perfectly blue; you might think there's no smog at all! The smog is overhead as well, but it's much harder to see. Why is there such a difference? It comes down to viewing angles: A vertical line straight up through the atmosphere crosses much less air than a line angled toward the horizon. Less air means less smog, so the sky overhead looks blue. On the other hand, when you look toward the horizon, you're looking through a lot more air. The smog is easier to see. A one-of-a-kind sensor aboard NASA's Terra satellite capitalizes on this angle effect to get a better view of how clouds and air pollutants scatter and absorb sunlight. By doing so, this sensor-called the Multi-angle Imaging SpectroRadiometer (MISR for short)-is helping scientists fill in a major piece of the climate change puzzle. Most satellite instruments look only straight down at the Earth. Layers of airborne particles (called aerosols) and smog are harder to see with this vertical view, and clouds often appear only as two-dimensional sheets of white. Clouds and aerosols both can reflect incoming sunlight back out to space, thus cooling the planet. But they can also absorb sunlight and trap heat rising from below, thus helping warm the planet. What is the net effect? MISR helps scientists figure this out by looking at the atmosphere at several angles-nine to be exact. Its nine cameras fan out across a range of angles from steeply looking forward (70.5 degrees from vertical), to straight down, to the same steep angle backwards. As the Terra satellite passes over a region, the cameras successively view the region at nine different angles. From these data, scientists can construct a three-dimensional picture of the cloud cover, revealing much more about cloud dynamics than a flat image alone. They can also see light bouncing off aerosol pollution from nine different directions, thus getting a fuller picture of how aerosols scatter sunlight. And they can even spot thin layers of heat-trapping air pollutants that might go unnoticed by other satellites. All this information comes just from looking at the atmosphere from a different angle. For more information, see http://www-misr.jpl.nasa.gov. Kids can learn about MISR, see MISR images, and do an online MISR crossword at http://spaceplace.nasa.gov/en/kids/misr_xword/misr_xword2.shtml. 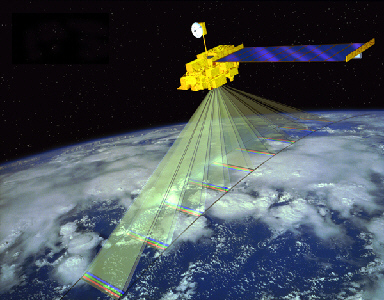 Caption: The MISR instrument on the Terra satellite views the atmosphere and Earth’s surface from nine different angles.